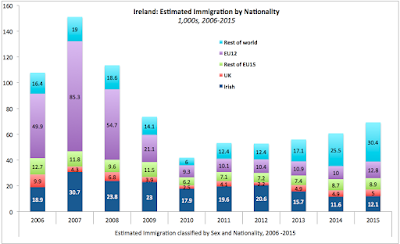 Having looked in the previous post at top level data for population changes in Ireland reported by CSO, now let's take a look at composition of migrants flows by nationality. This is going to be charts-heavy. There has been a significant increase of inflows of people from the 'Rest of the World' (ex-EU). Numbers of those coming into Ireland from outside the EU are up at 30,400 in 2015 from 25,500 in 2014. Pre-2015, average annual inflows of immigrants from outside the EU was 15,722, so last year things were pretty much ahead of the average for the third year in a row. Much of this is probably driven by big hiring numbers from multinationals which are increasingly moving their EMEA and MENA operations into Ireland. There has been a small uptick in the number of new comers from the Accession States (EU12), the numbers of which rose to 12,800 in 2015 compared to 10,000 in 2014. This is the second highest inflow rate since the start of the crisis. 2006-2014 average for these inflows (29,078) is still significantly above 2015 figure. Again, I would suspect that much of this increase is accounted for by MNCs and also by demand for particular skills. Note: I will blogging on skills matters subsequently in a separate post. There has been virtually no change in inflows of people from the UK over the last 3 years, so nothing worth spotting here in terms of trends. Rest of EU-15 immigration flows also were relatively static, up to 8,900 in 2015 compared to 8,700 in 2014. Nonetheless, this has been the busiest year for EU15 migration inflows (ex-UK and Ireland) for some time - since 2009. Number of Irish nationals returning rose from 11,600 in 2014 to 12,100 in 2015. Which, kind of directly flies in the face of a number of media reports about 'returning migrants'. 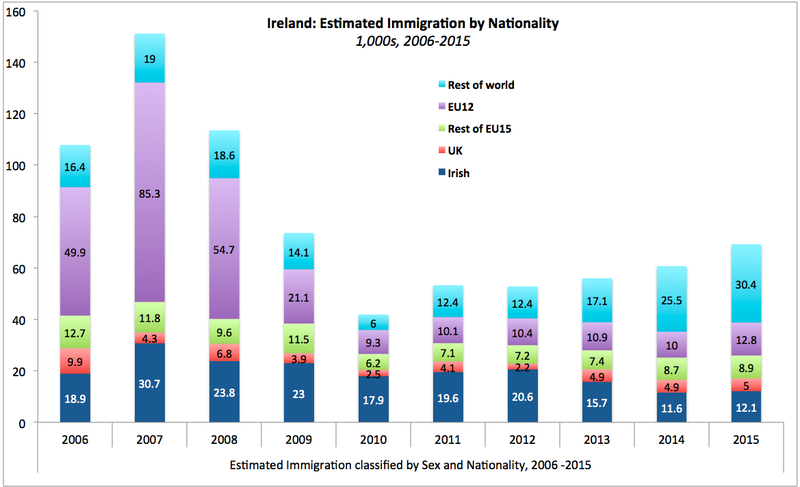 Apparently, the migrants are not quite returning, as current rate of immigration in Ireland by Irish nationals was the second slowest on record and much closer to the lowest year (2014) than to the third lowest (2013). Irish emigration continued to decline in 2015 for the second year in a row. 2014 emigration of Irish nationals stood at 35,300 down from 40,700 in 2014 and down substantially on crisis period peak of 50,900 in 2013. 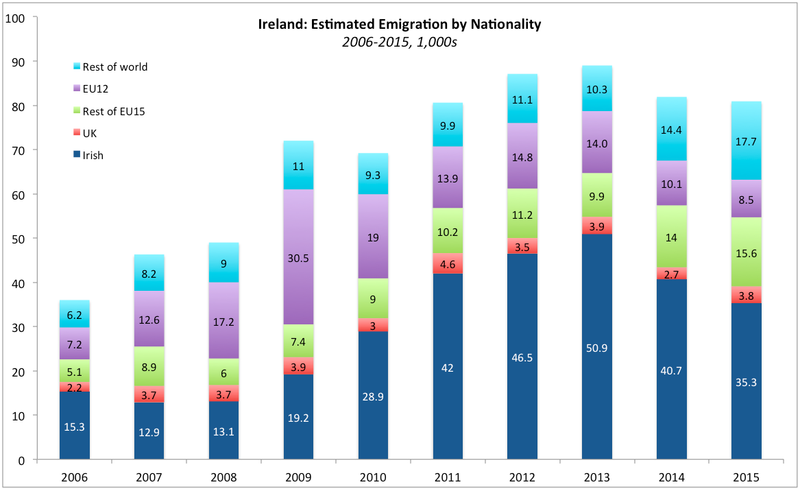 The rate of emigration is now closer to 2006-2014 average of 29,444 that before, but it is still substantially above that number. Crucially, in more normal times, emigration by Irish nationals stood at around 13,700, which is well below current levels. Emigration by UK nationals out of Ireland remained pretty much stable and on-trend. Historical pre-2015 average is for annual outflow of 3,467 and in 2015 the number was 3,800. Emigration by the nationals of the EU15 states (ex-UK and Ireland) was up in 2015 at 15,600 compared to 14,000 in 2014. The rate is rising now for two years and is well ahead of 9,078 average for 2006-2014 period. This is interesting, as it reflects some shift in MNCs employment: in the past, MNCs were focusing much of their hiring on old EU markets, demanding language skills from these countries. Now, it seems the momentum is shifting toward ex-EU15 markets. Notably, pre-crisis average emigration by EU15 nationals stood at 6,667 per annum, very substantially below the 2015 figure. In contrast to EU15 pattern, emigration by the Accession EU12 nationals fell significantly in 2015 to 8,500 from 10,100 in 2014. This is the slowest rate of outflow for any year from 2007 on and significantly below the 2006-2014 average annual rate of outflow of 15,478. Rest of the World (ex-EU) emigration picked up, rising to 17,700 in 2015 compared to 14,100 in 2014 and against the 2006-2014 average of 9,9833. The reason for this, most likely, is the turnover of MNCs-employed tech workers and specialists who tend to stay in Ireland for 2-3 years and subsequently leave. Rate of net immigration from the 'Rest of the World' (ex-EU) picked up somewhat in 2015, rising to 12,700 from 11,200 in 2014. 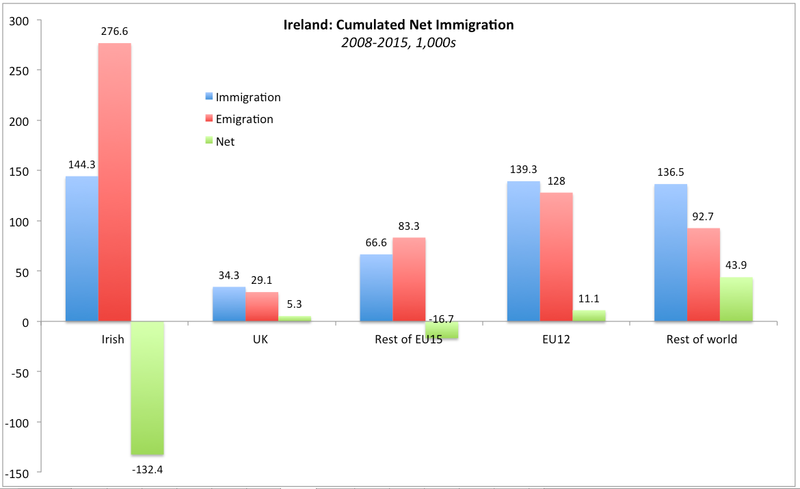 This is the highest rate of net increase in ex-EU population in Ireland for any year between 2006 and 2015. Second noticeable change in 2015 was positive contribution of EU12 (Accession states) nationals, with their net immigration at 4,300 in 2015 marking the first positive net result since 2008. EU15 (ex-UK and Ireland) net emigration remained significant and increased, with 6,700 more nationals of EU15 (ex-UK and Ireland) leaving Ireland than coming into Ireland in 2015, up on 5,300 in 2014. This marks the third year of rising net emigration by EU15 nationals out of Ireland and 6th consecutive year of negative net immigration by this group of residents. Irish nationals net emigration from Ireland remained very substantial in 2015 at 23,200. The number is lower than 29,200 net emigrations recorded in 2014 and the lowest reading in 4 years, but it is still well above the crisis period average. In simple terms, things are getting worse slower in this metric, they are not getting better. Combined 2008-2015 net movements of people by nationality are shown in the chart below. Since 2008 through April 2015, there are 5,200 more UK nationals residing in Ireland, while the number of EU12 migrants rose 11,100. 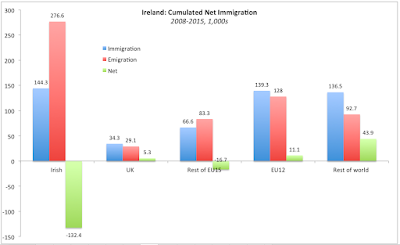 By far, the largest net emigration on a cumulative basis relates to outflow of Irish nationals: between 2008 and 2015, 132,400 more Irish nationals left the country than came back into the country - annual average rate of net emigration of 16,600 and in 2015 annual net emigration for Irish nationals was 6,700 above that.